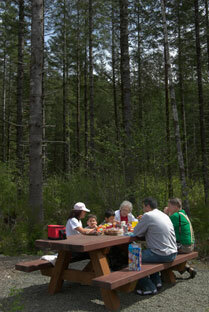 The Tillamook Forest Center site offers some great Picnic & Gathering places for groups of all sizes both on-site and immediately nearby. If it’s a small family or group picnic, you'll find five large picnic tables in a cool forested location adjacent to the parking area. There are also 16 rustic benches in locations around the site that make for great places to stop and rest, open the lunch box or just read a book. The Wilson River Suspension Bridge makes a nice lunch spot: there are tables and chairs just outside the north doors. Across the bridge and just upstream is the Jones Creek Day Use Area and plenty more picnic tables. The entry plaza and the seating areas around the pond, make for nice lunch locations for smaller groups and individuals. If you are a large group (more than 20 people) we'd suggest you consider the Smith Homestead Day Use Area, less than a half-mile east of the Tillamook Forest Center. There, a 2,000 square foot shelter provides an excellent venue for group gatherings, family picnics and events and is available for daily rental. These areas are enjoyed on a first-come, first-serve basis. We kindly ask your help in not bringing food or drink into the exhibit gallery.